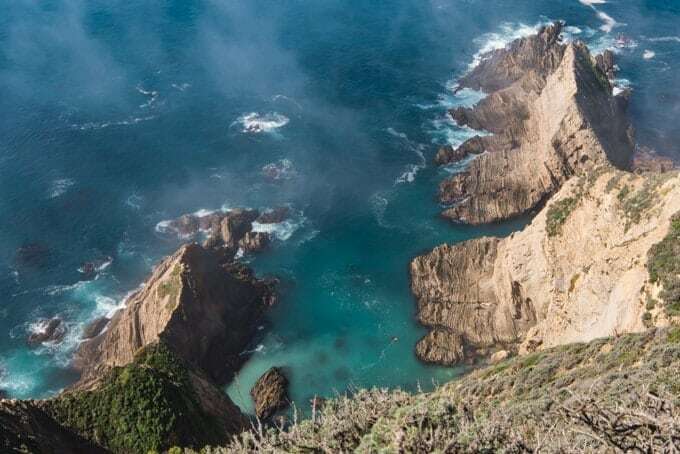 Big Sur is a rugged stretch of majestic California coastline offering beaches, hiking, camping, scenic bridges, a lighthouse, breathtaking waterfalls and sheer cliff faces. 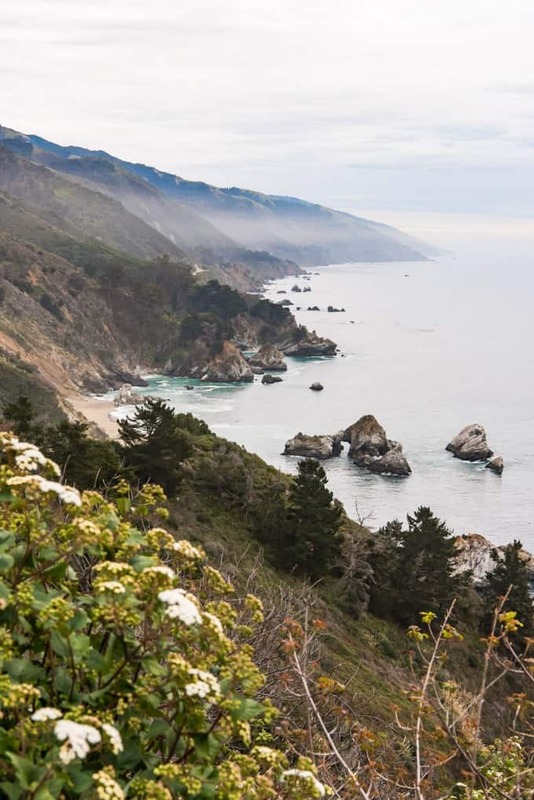 Whether you are planning a day trip to Big Sur or a longer stay, don’t miss these stops along the famed Pacific Coast Highway! 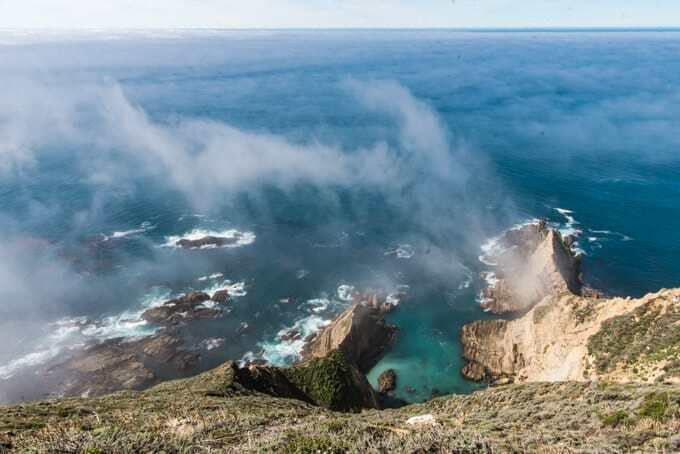 About 2 1/2 hours south of San Francisco is a rugged stretch of pristine California coastline that boasts some of the most gorgeous views you can imagine. It’s mile upon winding mile of pure scenic bliss where you will find yourself pulling over time and again to gaze in awe at the staggering, raw beauty that is pretty much the definition of breathtaking. It’s a place of sheer rocky cliffs, dreamy beaches, hidden coves, and ocean as far as the eye can see. The staggering decadence of the scenery is almost an assault as you are struck by the beauty of the place around every turn, of which there are many. And each time you get out of your car, your senses will be filled with the sound of crashing waves and the smell of salt in the air. 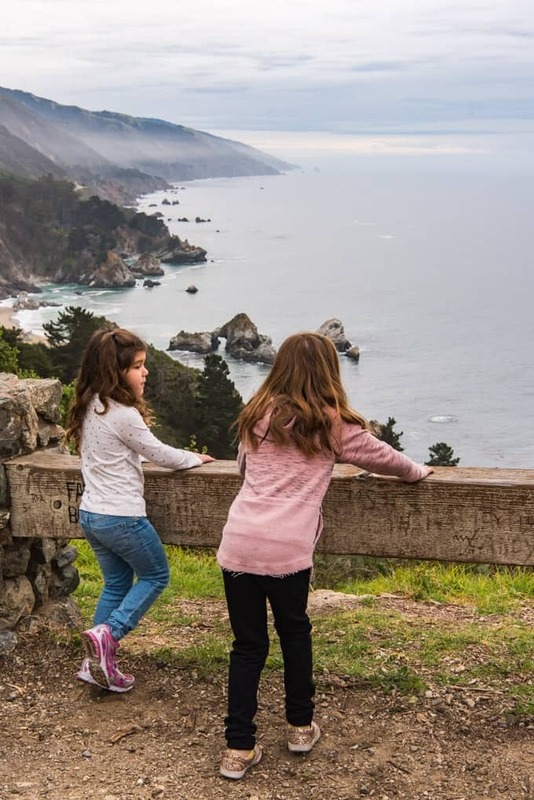 We recently did a quick weekend camping trip in Big Sur with our girls and wanted to share some helpful information for anyone who might be thinking of planning a trip to California! 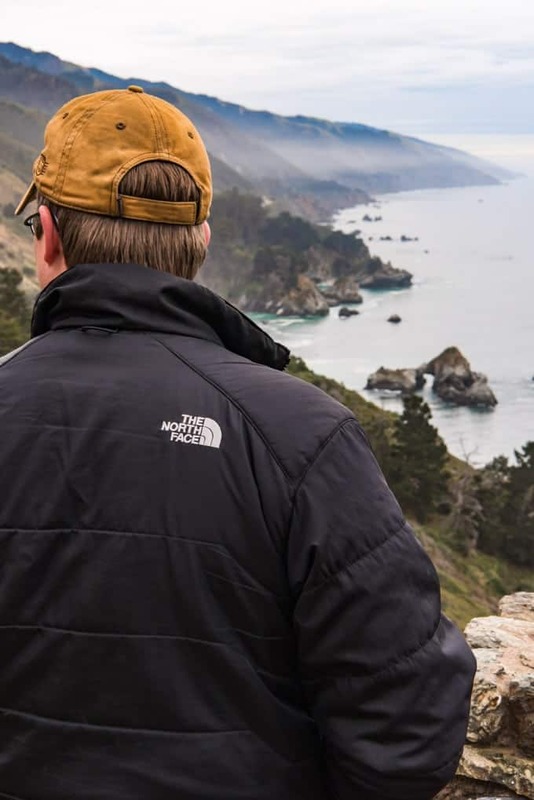 Big Sur is one of our favorite places to visit in California. 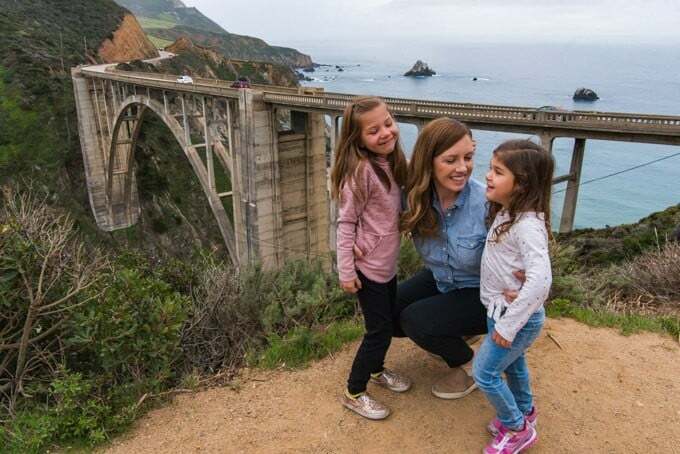 California’s Highway 1, better known as the famed Pacific Coast Highway, follows right beside the ocean most of the drive, sometimes dipping level with the sandy beaches and crashing waves, and rising high above in sections, curving around steep, jutting promontories and bridging deep canyons. It’s easy to see why this is one of the most famous and scenic drives in the state. 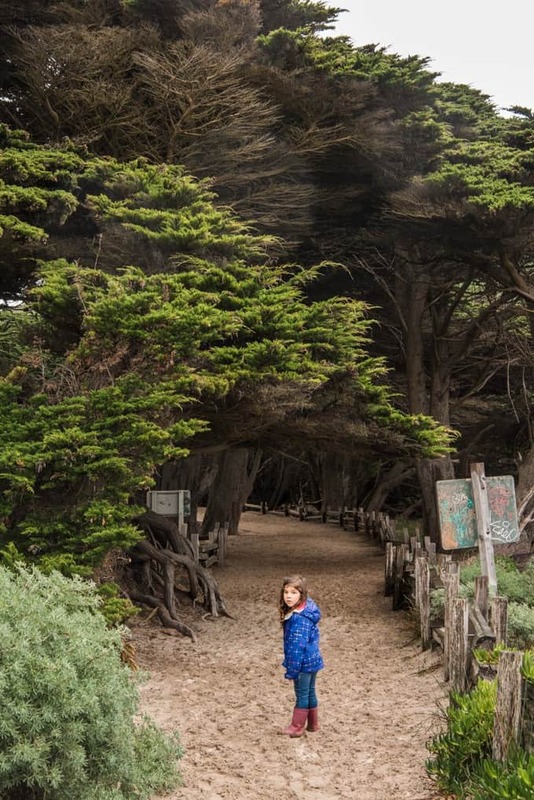 A Pacific Coast Highway road trip is on many traveler’s bucket lists for good reason! 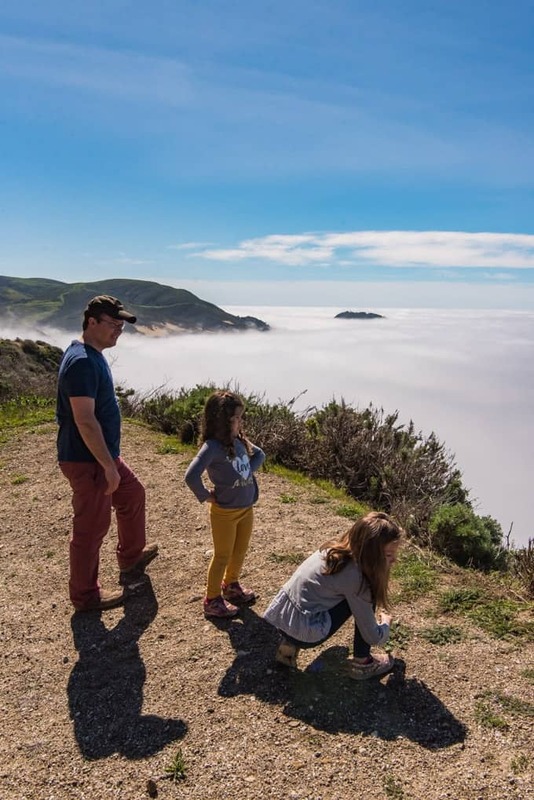 And the numerous turnouts provide more than just gorgeous views – there are opportunities for spotting migrating gray whales, sea lions, dolphins, and soaring condors, among other wildlife! 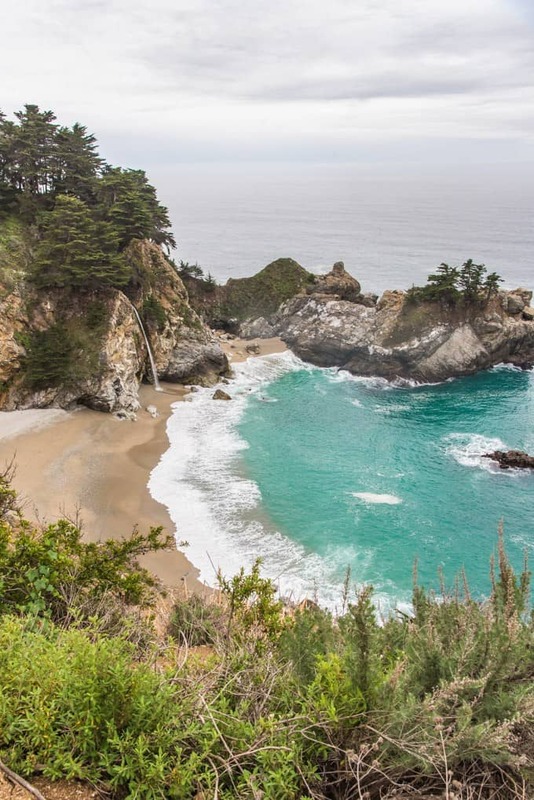 There is a good reason why McWay Falls is at the top of our list of things to do in Big Sur. 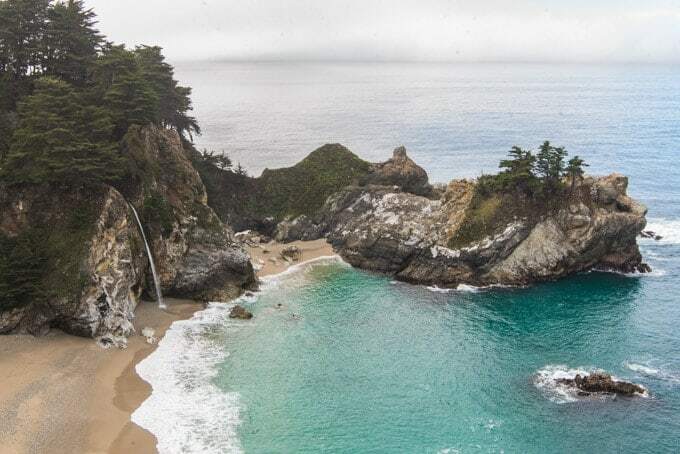 McWay Falls isn’t just a waterfall, it’s actually an even more rare form of waterfall known as a tidefall, which flows directly into the ocean. 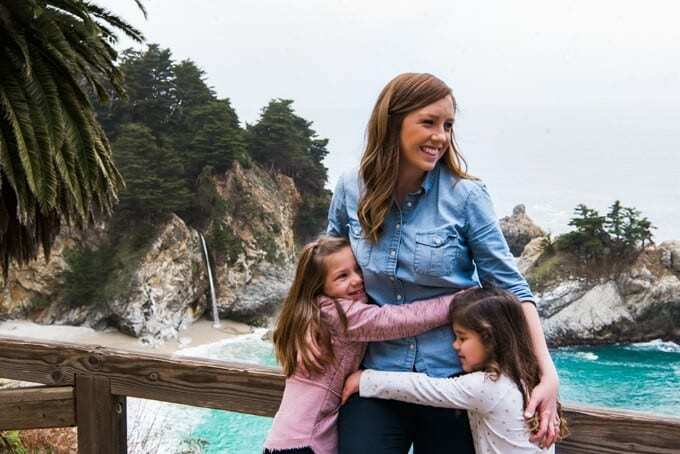 Also called a coastal waterfall, this stunning tidefall is one of only two in California (the other being Alamere Falls, just north of San Francisco) and this natural wonder is the jewel of Julia Pfeiffer Burns State Park. 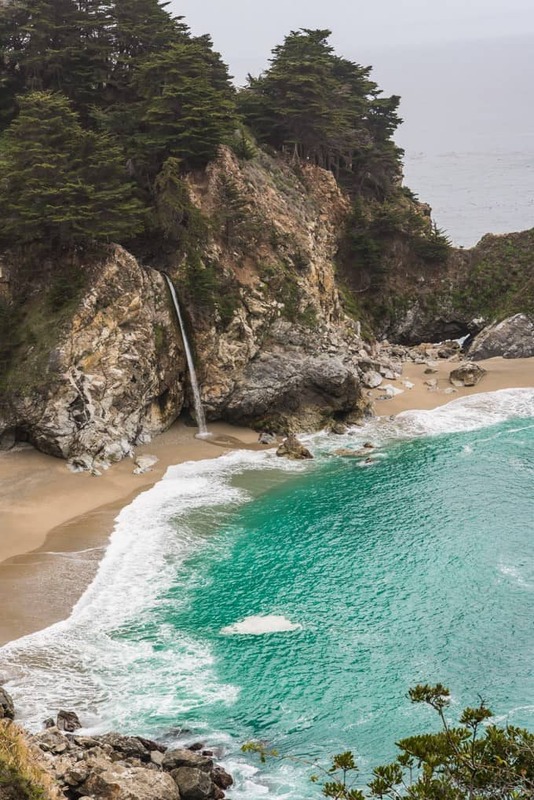 Coastal waterfalls are rare and McWay Falls is absolutely worth adding to your Big Sur itinerary. 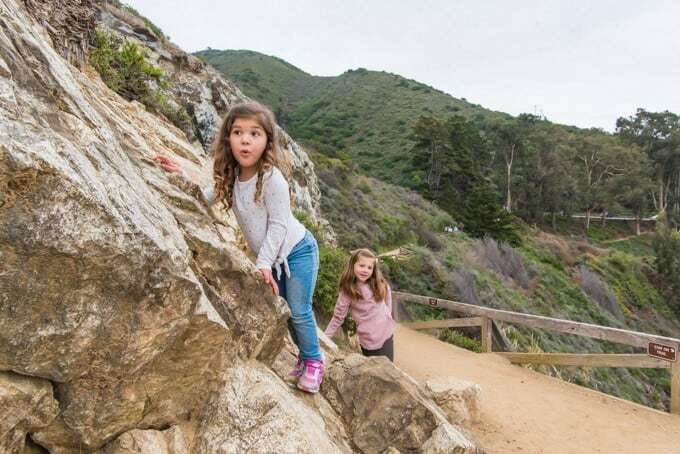 Our girls loved this spot because there were rocks to climb on (always a win with kids when traveling), a cool tunnel to run through where they could shout and hear their echo, and of course, gorgeous scenery with a really beautiful waterfall. 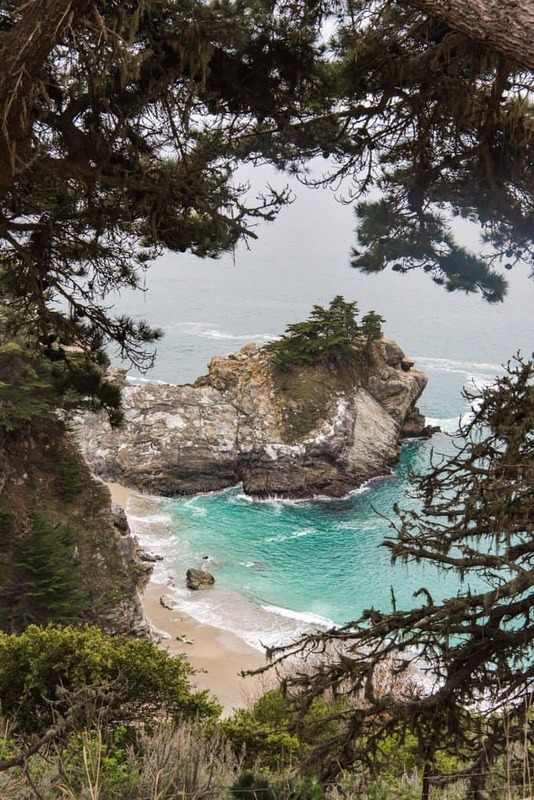 A great view of McWay Falls is easy to access by way an easy trail that is both short and flat. 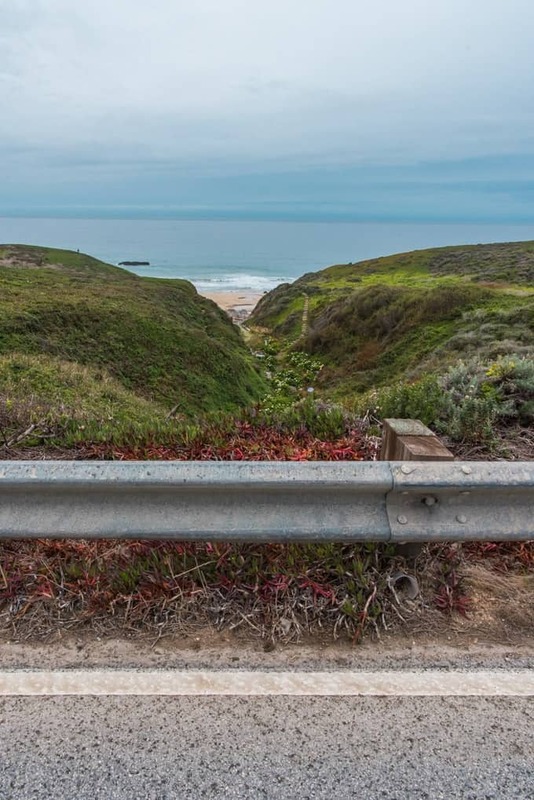 And the view is free since there is plenty of parking right along the road with an entrance right off the west side of Highway 1 marked by a sign to the Overlook/Waterfall Trail/Pelton Wheel. 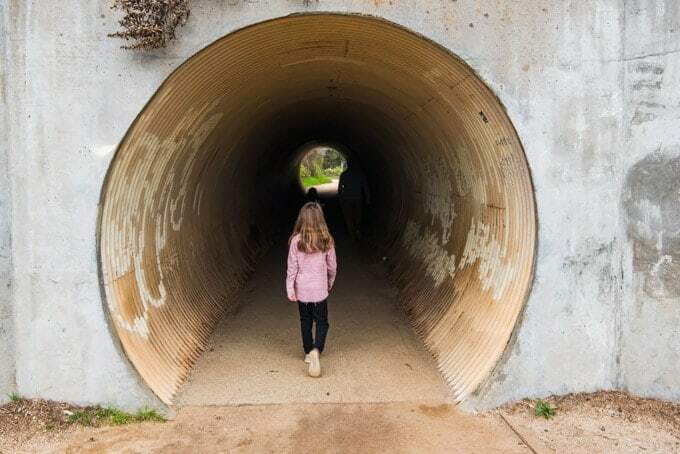 Or you can park in the state park parking lot for a small fee and walk through a round culvert tunnel under the highway. The 80-foot tall waterfall flows directly onto a small sandy beach in the cove below, although that wasn’t always the case. 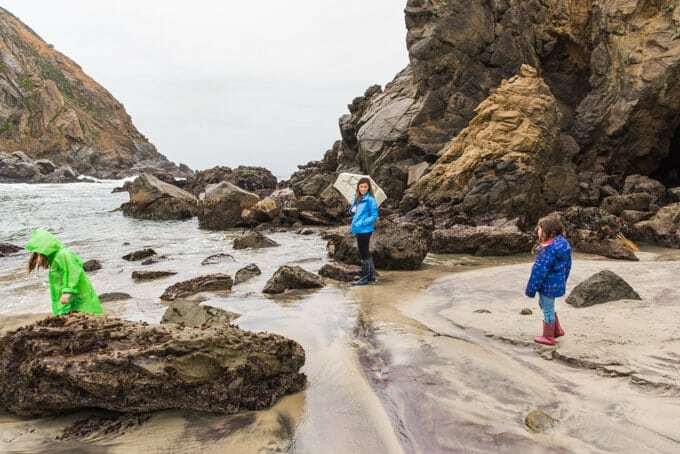 Until 1985 when a rock slide occurred just north of the cove, there was no beach at this cove. 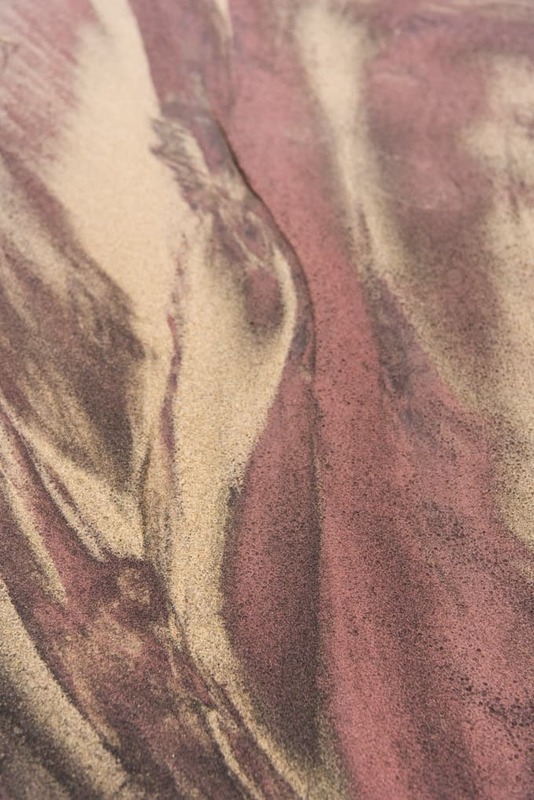 After the slide, a number of small beaches were formed by sand that drifted downshore thanks to the current, which will eventually likely also cause this beach to disappear. There is no trail down to the beach below, at least not a safe one. But despite warning signs, we saw footprints in the sand below so some daring (and possibly foolhardy) souls make their way down to it. 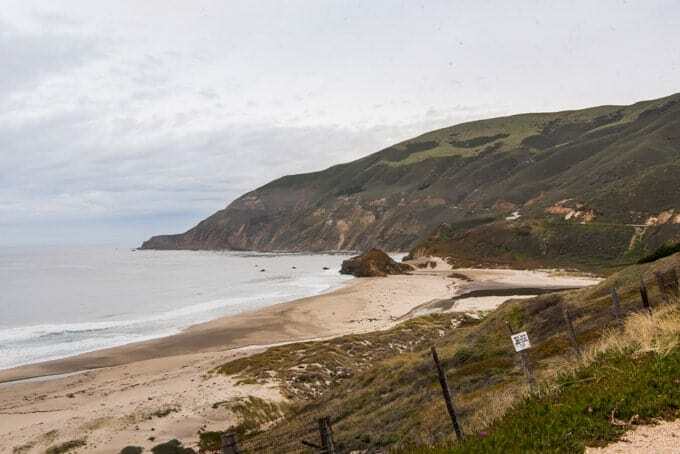 It’s not something I would recomment though, because not only is the beach area dangerous due to crumbling rocks and unpredictable tides and currents, but the area is also vulnerable to erosion and covered in poison oak. 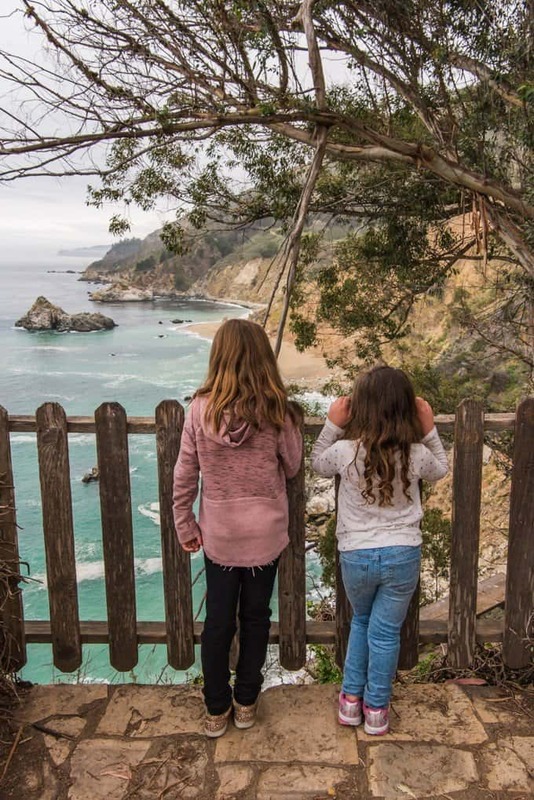 Be sure to walk all the way along the path that is the McWay Waterfall Trail to see the all that remains of the once grand “Waterfall House,” a seaside mansion built in 1940 by Boston socialites Lathrop and Helen Hooper Brown. The house itself was demolished in 1966, leaving only the foundation, the back patio, and the gardens, but during the 16 years that the Browns owned the property, they decorated it with masterpieces by Degas and Gaugin. 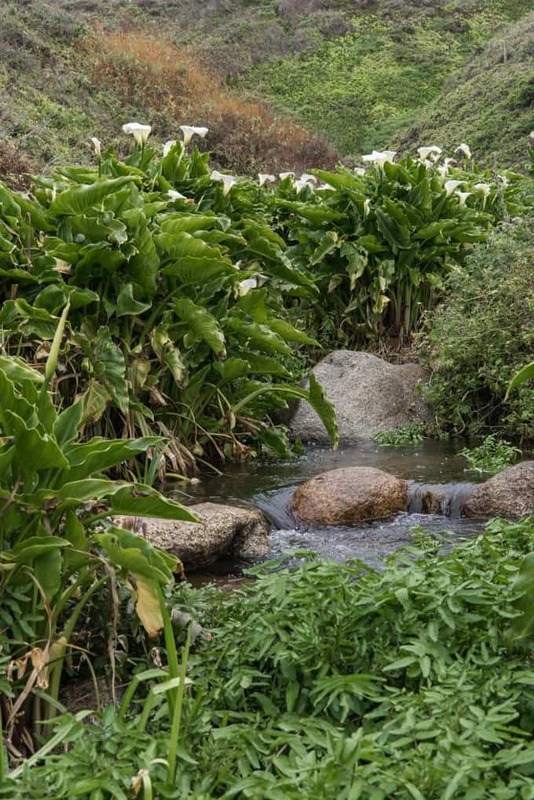 When the Browns left Waterfall House after 16 years of living there, they never returned and eventually donated the land to the state in 1961 in honor of an early homesteader in the region and friend to the Browns, Julia Pfeiffer Burns. 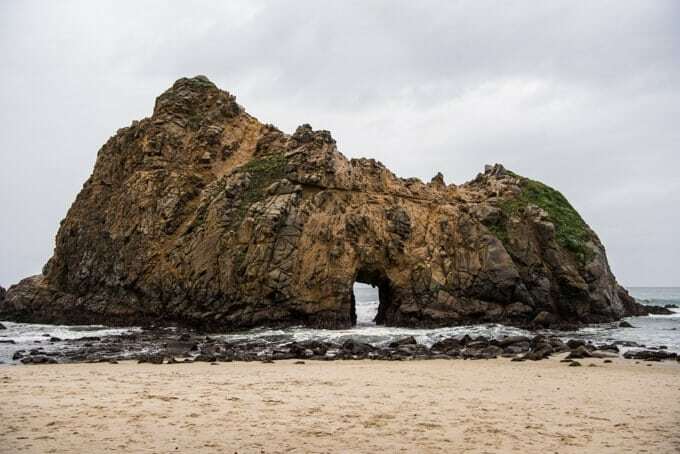 This impossible to miss iconic Big Sur landmark is easily one of the most photographed and photogenic spots to pull over and stretch your legs as you drive along the coast. 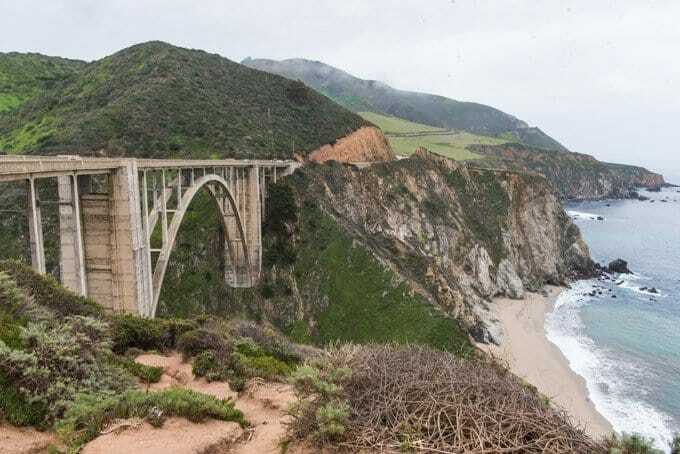 120 miles south of San Francisco and just 13 miles south of Carmel, Bixby Creek Bridge is a historic bridge that opened in 1932, spanning Bixby Creek and giving access to Big Sur, which was virtually cut off during much of the year by an almost impassable road that led inland. 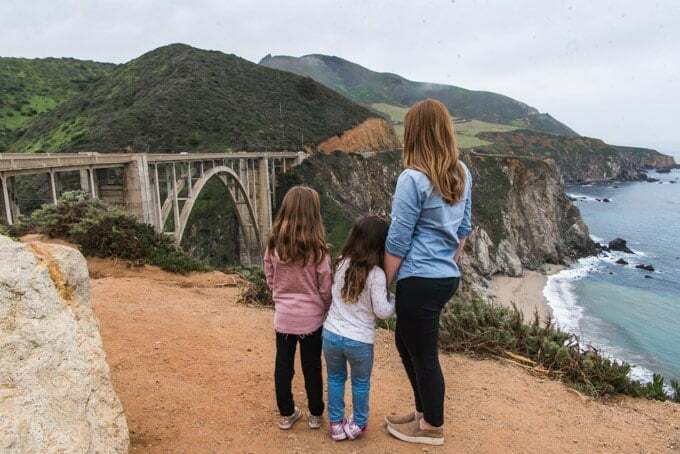 Bixby Bridge is one of the tallest single-span concrete bridges in the world and is probably one of the world’s most photographed bridges. You probably recognize it from luxury car commercials and movies. I have to admit that although I don’t think I have much of a fear of heights, I was clenching my stomach and holding tight to my little one’s hands while looking at the steep drop-offs to the waves below! 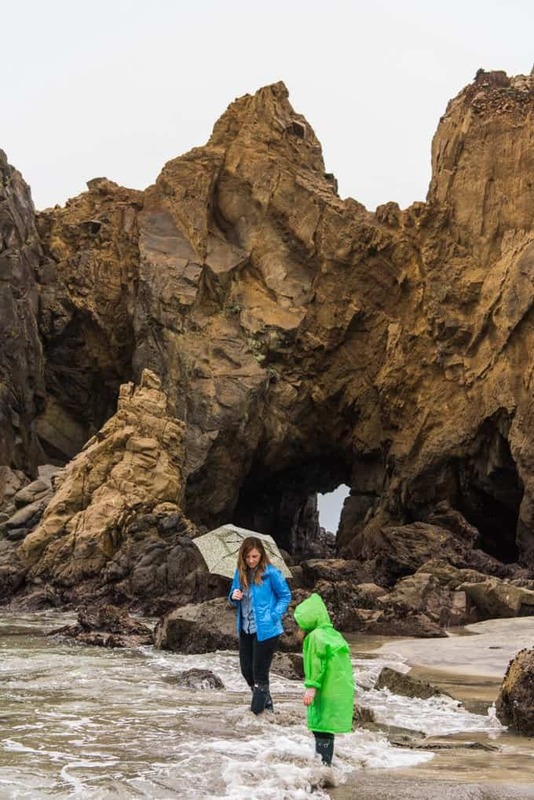 When we visited, Pfeiffer Beach was socked in with a drizzly rain that had been threatening to start pouring. So it wasn’t the dynamic, beautiful lighting that this beach is heralded for. During December and January, when the sun is low on the horizon, the rock formation known as the Keyhole Arch creates a natural sun portal where light pours out of the archway, creating a dreamy, otherworldly landscape that I would love to photograph some day. 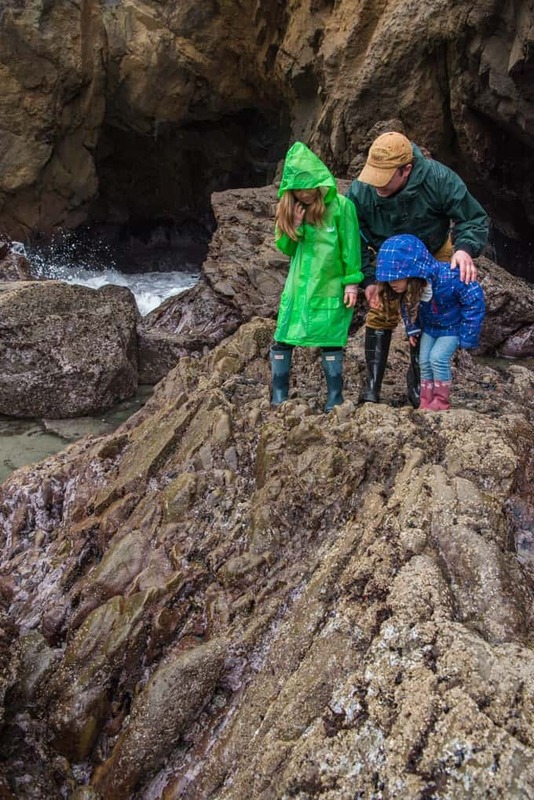 Despite the less-than-optimal conditions, we were prepared with rain boots, jackets and umbrellas and still enjoyed exploring the tide pools and strolling along the beautiful purple sand beach, which is actually created by white, magenta, and black sand that combines in places to create the amethyst hue that this beach is also known for. 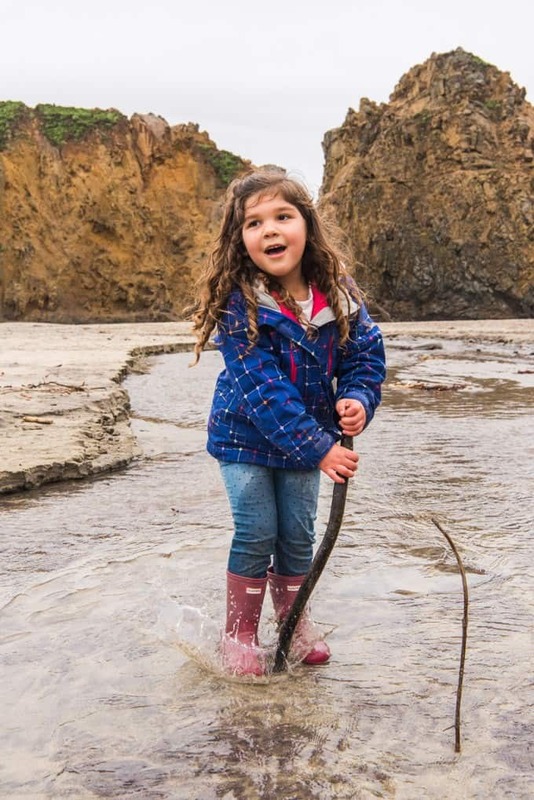 The kids loved the tide pools and playing with sticks in the stream that flows out to the ocean and creates shifting designs in the white, purple, and black sand. But finding the beach itself can be tricky for the uninitiated. The only hard part is finding the turnout, which is an unmarked road on the western side of Highway 1, known as Sycamore Canyon Road. 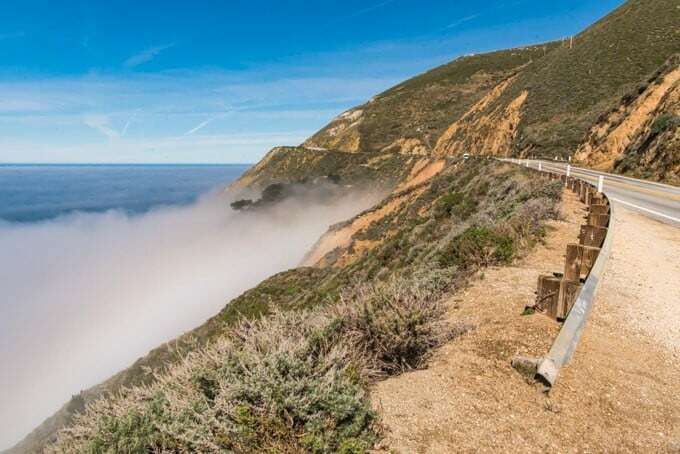 The trick is to watch for the only paved, ungated road on the west side of the highway between the Big Sur post office and Pfeiffer Big Sur State Park. There are no markings, just a very sharp turn that takes you down into Sycamore Canyon for about two miles of narrow, winding road until you reach a large parking area where you have to pay a small entrance fee before an easy, short walk through a path shaded by cypress trees to get to the beach. You can actually see the beach from the parking lot. 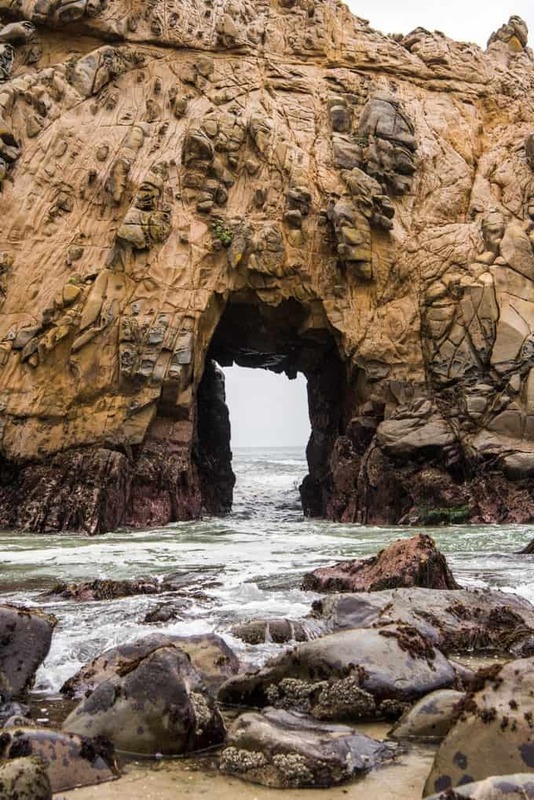 Keyhole Arch is in a massive rock formation that sits just off shore. 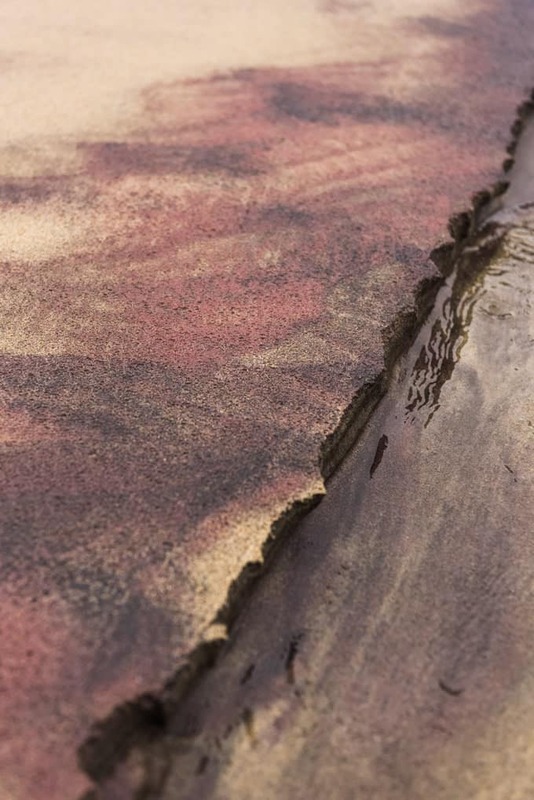 Water flows through the opening constantly as the waves crash against the rocks, sweeping in and out. 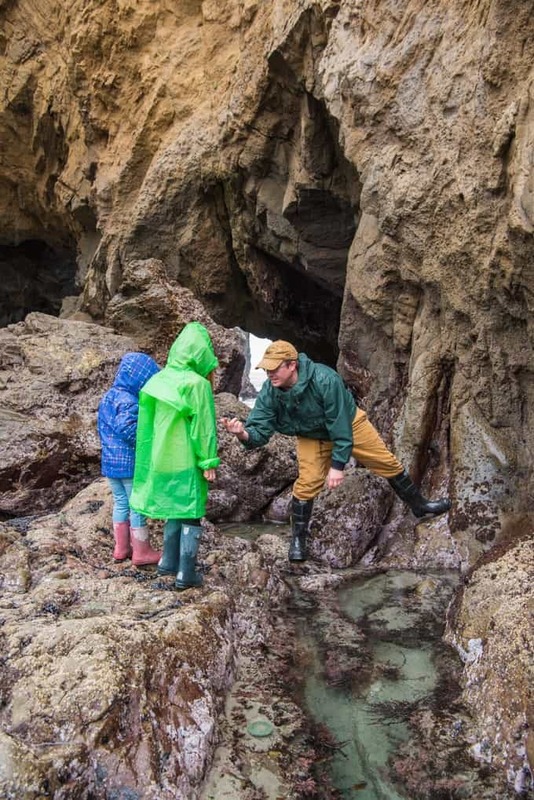 If you are venturing out onto the rocks in front of the arch or in neighboring tide pools, be careful as the waves can really sneak up on you! 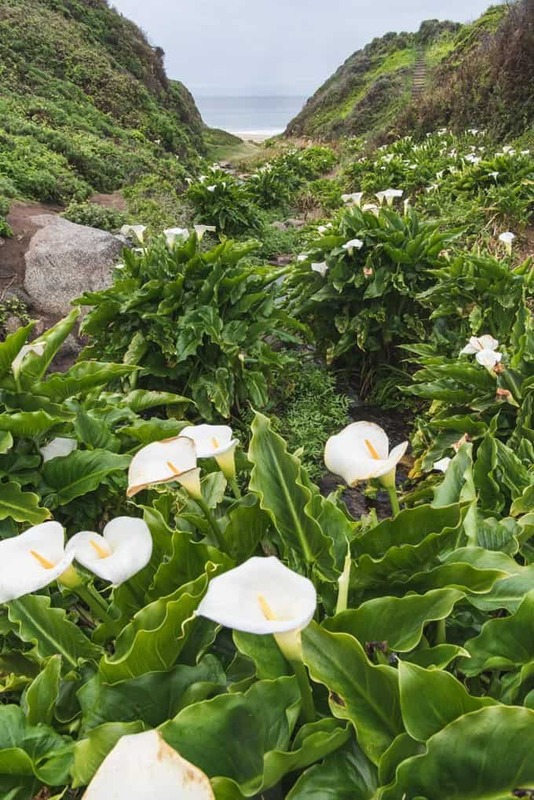 Calla Lily Valley was one of those hidden gems that we stumbled upon while we were driving along the Pacific Coast Highway. 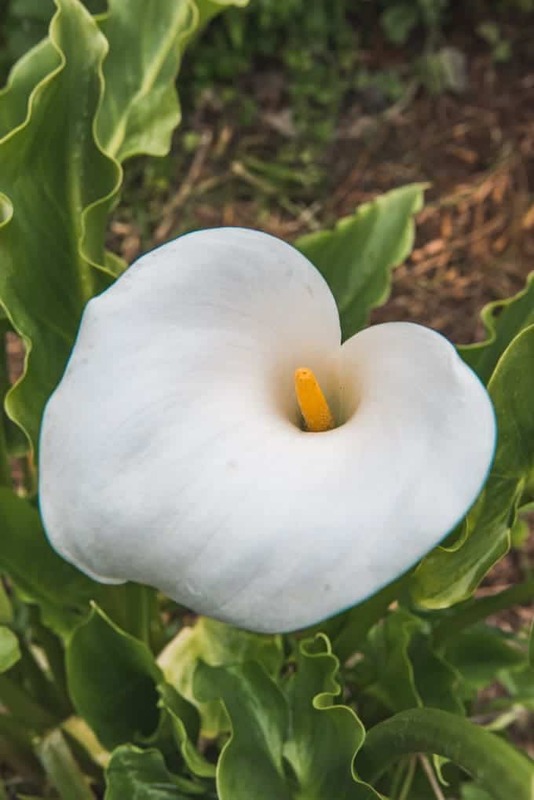 As we were driving, my husband just happened to notice this small ravine filled with beautiful, blooming calla lilies and we pulled over to explore. 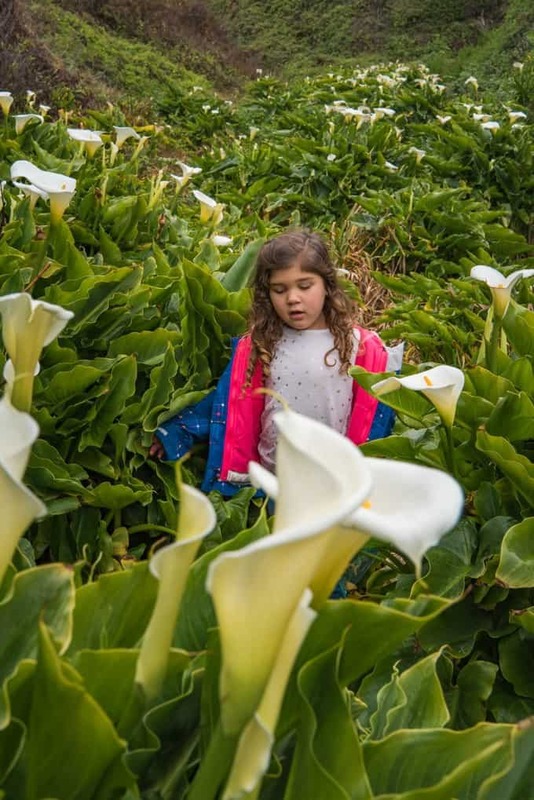 Unbeknownst to us, the wild calla lilies bloom there between February and mid-April and we had the serendipity to be in the area at just the right time to enjoy the gorgeous wild flowers. I have never seen so many calla lilies in one place! 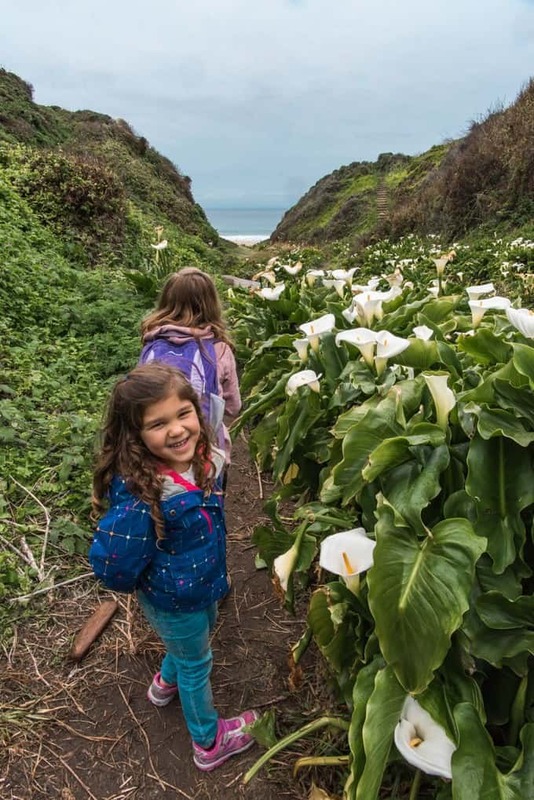 This area of Garrapata State Park is easy to find by taking the paths along the bluffs overlooking the beach and following the trail down the stairs to Doud Creek, where the calla lilies bloom. 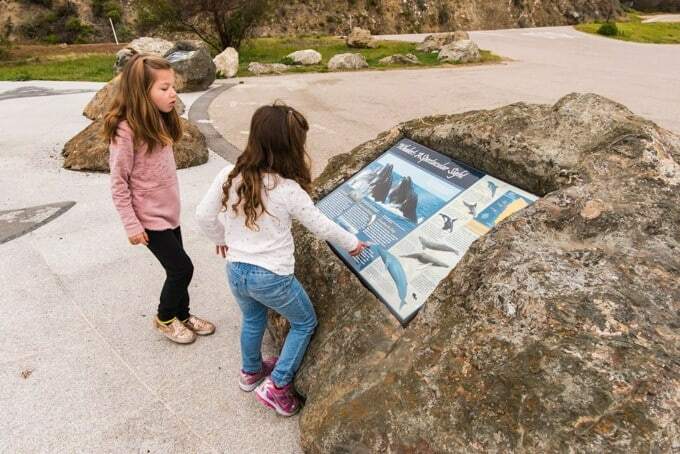 From there, you can follow the trail all the way down to Garrapata Beach and enjoy a lovely spot for a beach picnic. 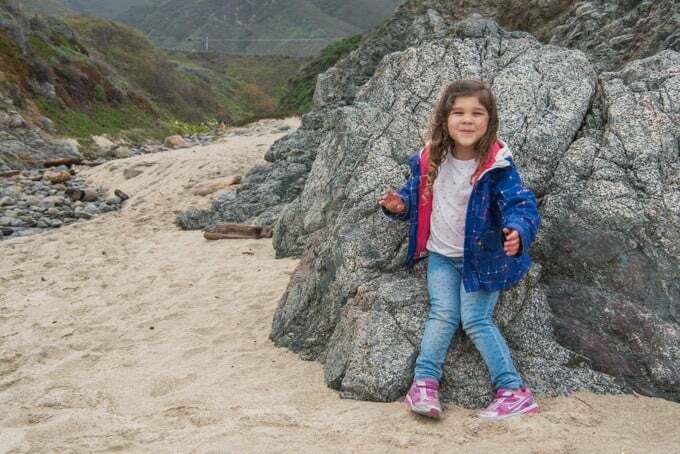 There is lots of camping available in Big Sur, though if you want a spot at one of the many non-reservable campsites, you need to show up early, especially if you are hoping to stay on a weekend. Or if you are planning far enough in advance, you can reserve a campsite at one of the areas many state parks. 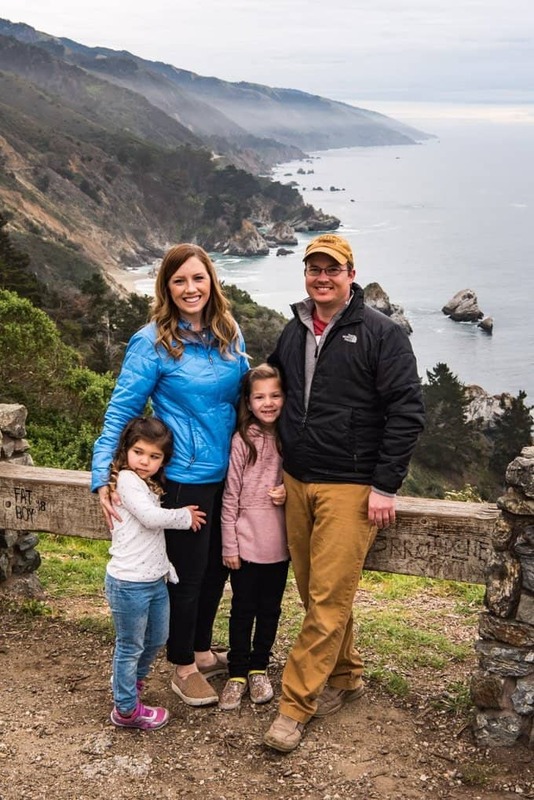 Camping definitely isn’t for everybody and not for the faint of heart, especially when doing it with young children, but we love being out in nature together and have learned a lot along the way about what kind of camping is most fun and comfortable for our family. It also helped that the two campsites next to ours had families with girls the same age as ours and they all became great friends, laughing and making up games while the grown-ups chatted or cooked dinner in dutch ovens over the campfires. Those kind of interactions and making friends with strangers is one of my favorite things about traveling! 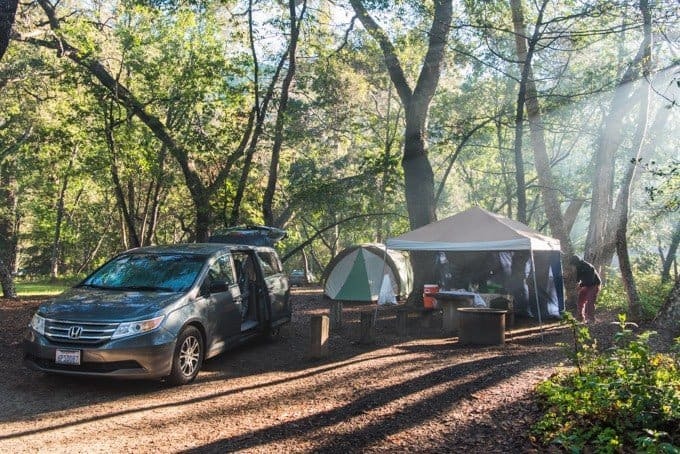 We camped in the beautiful Pfeiffer Big Sur State Park, which has large sites under the shade of lots of massive trees along the Big Sur River. There is also a lodge, restaurant, and store here, and there are even showers in the park bathrooms that can be operated with tokens. 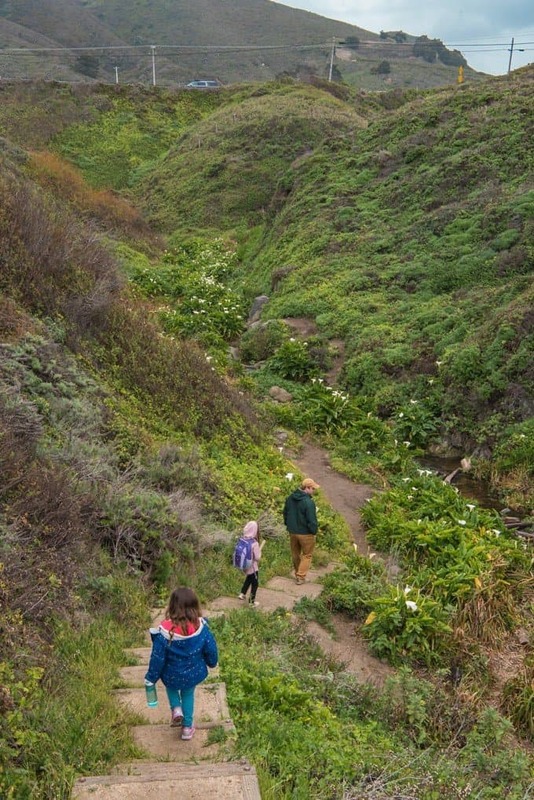 Pfeiffer Big Sur State Park is inland and has a network of hiking trails through groves of coastal redwoods. 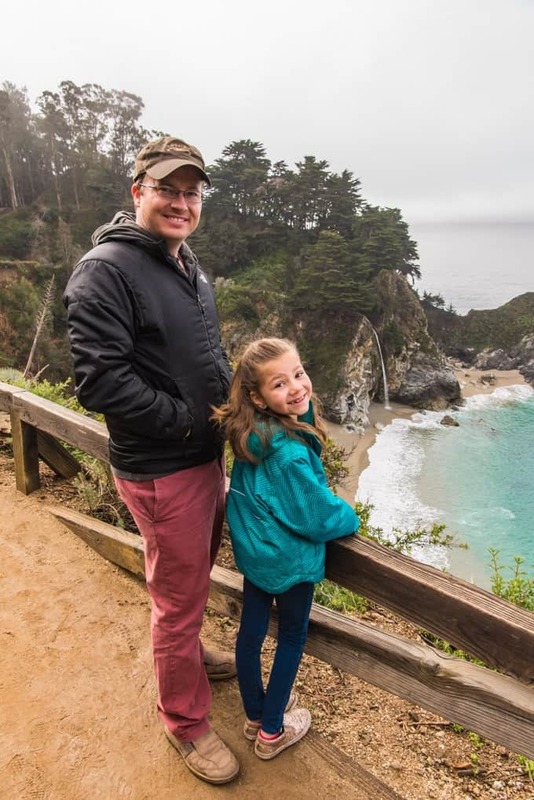 We didn’t make it to Pfeiffer Falls, but it’s supposed to be a great waterfall hike that is easily accessible via a 2-mile hike from the parking lot at Pfeiffer State Park. 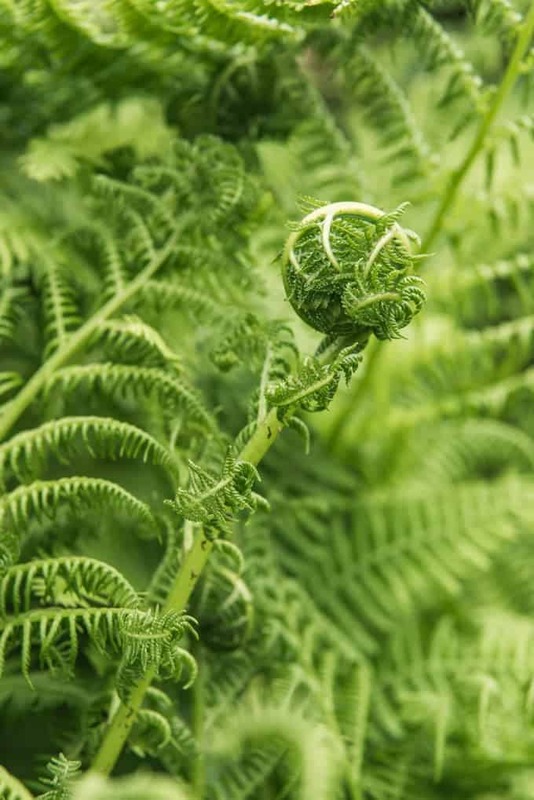 Just be on the lookout for poison oak, no matter where you are camping in Big Sur. One of the campground hosts we talked with told us that they had a guy come in late one night and set up a hammock right smack in a patch of poison oak without realizing it and it was not a pretty sight. 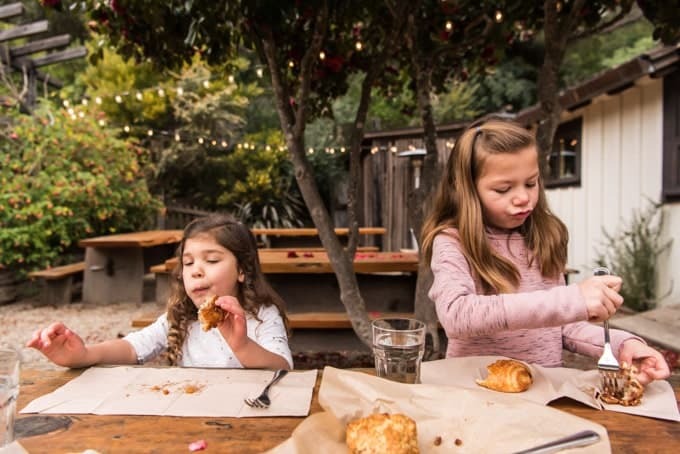 Looking for where to eat in Big Sur? All options are pricey given that things are remote here, but there are restaurants all along the route that you can stop at. 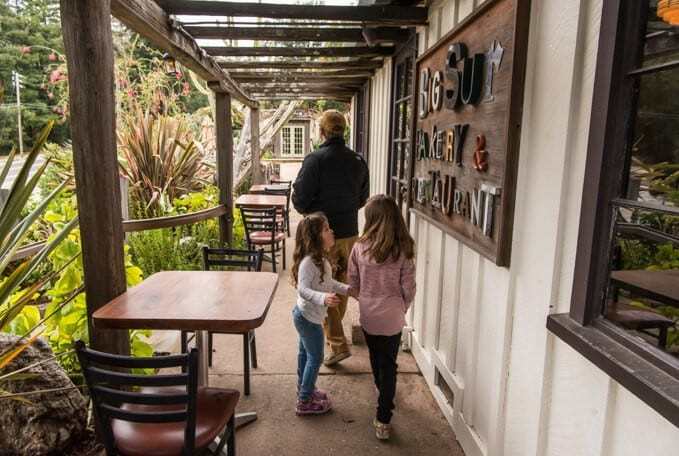 Since we were camping, most of our meals were made over the fire or on our campstove, but we splurged on breakfast at the famous Big Sur Bakery. 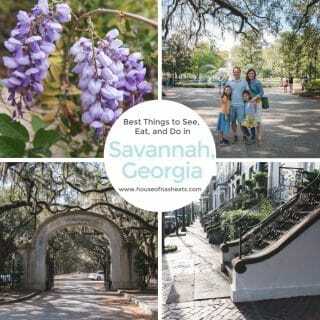 It was our only can’t-miss food destination for this weekend trip and I’m dying to get my hands on their cookbook. 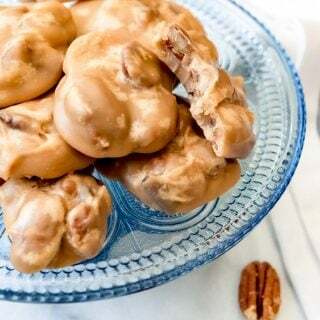 Their pecan sticky buns and chocolate croissants were a delicious treat. We were glad we were there before they opened as a rush of people showed up just after we did and the bakery is known to sell out too early in the day. An added bonus were the beautiful gardens surrounding the restaurant. 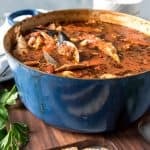 And for those who are looking for more than just pastries or sweets, there is an actual menu for other meals including things like flatbreads, entrees, soups, and salads. 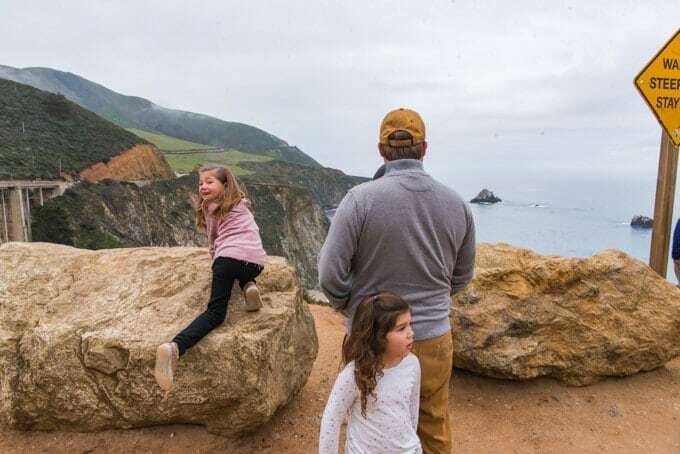 We didn’t make it to any of these places during this most recent trip to Big Sur, but it’s always nice to have reasons to go back and visit a place you loved and have it still be new. 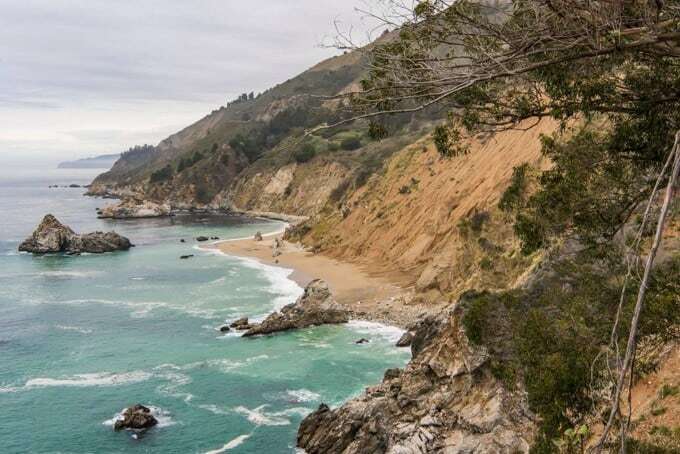 So next time we go, we are interested in hitting up some of these other Big Sur hot spots! 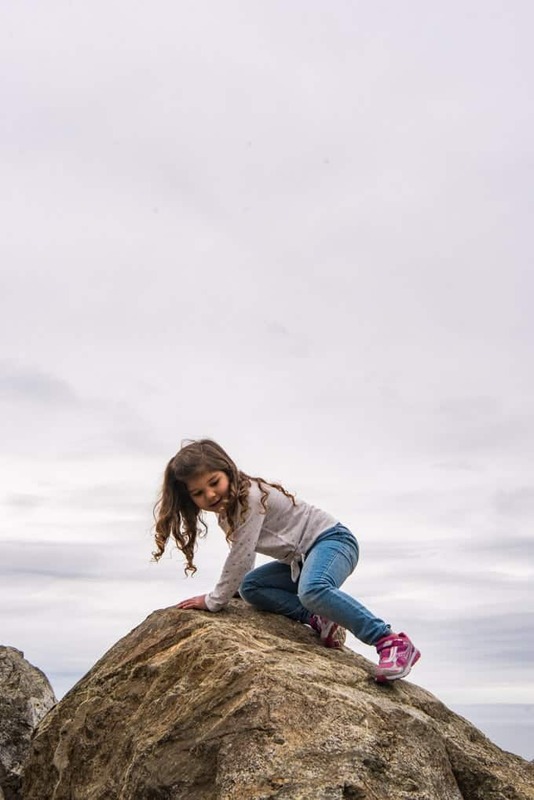 Point Sur State Historic Park – The Big Sur lighthouse is here, built on top of a huge, isolated rock in 1889 at the edge of one of the flat, grassy stretches of coastline in the area. The lighthouse is still in use and you can actually go into the lighthouse itself and go on a three-hour guided tour of the park if you plan in advance and show up early for one of the tour spots. Point Lobos State Reserve – A narrow, rocky promontory with thick woodland for hiking, wildlife, pretty coves and small islands, this one is one the northern end of Big Sur, close to Monterey and you could tell as we drove past on our way out how popular it was with the weekend set by all the cars parked along the road and the crowds of people walking towards the entrance. Glamping at Treebones Resort or Ventana -Because who wouldn’t want to spend the night in a “human nest” or a yurt?! 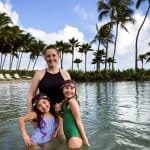 I have a strange fascination with glamping but still haven’t been and this needs to change. 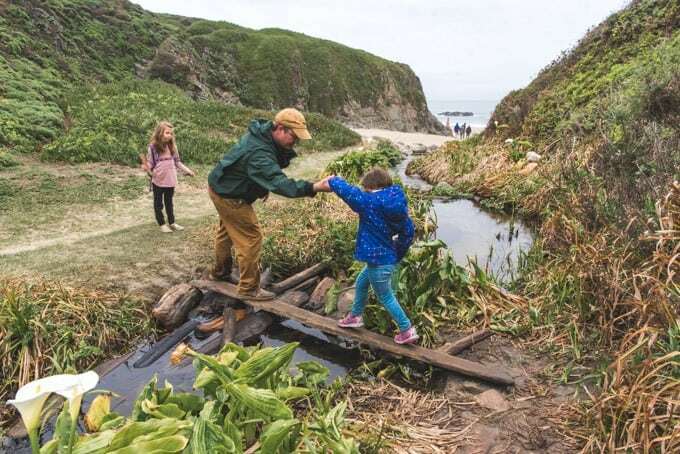 Andrew Molera State Park – Lots of hiking here to do here, and you can also go fishing or horseback riding in this park. Plan in advance: Cell service drops off pretty much as soon as you leave Carmel-by-the-Sea. 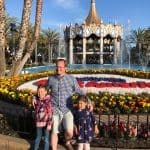 The forced disconnect means no apps or maps, and if you want to know what the best hikes are, where to get food, or which beaches and state parks to stop at, you are going to need to find out in advance. 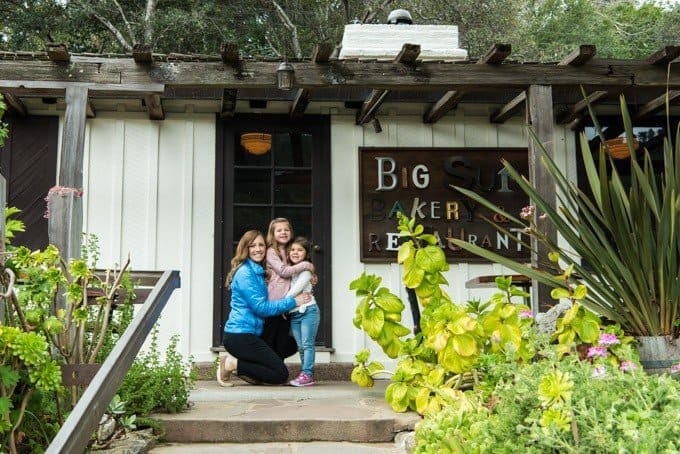 Things are far apart: Big Sur is a village, at best, with a post office, the Big Sur Bakery, and visitor center with tourist information at Big Sur Station. But that’s about it. 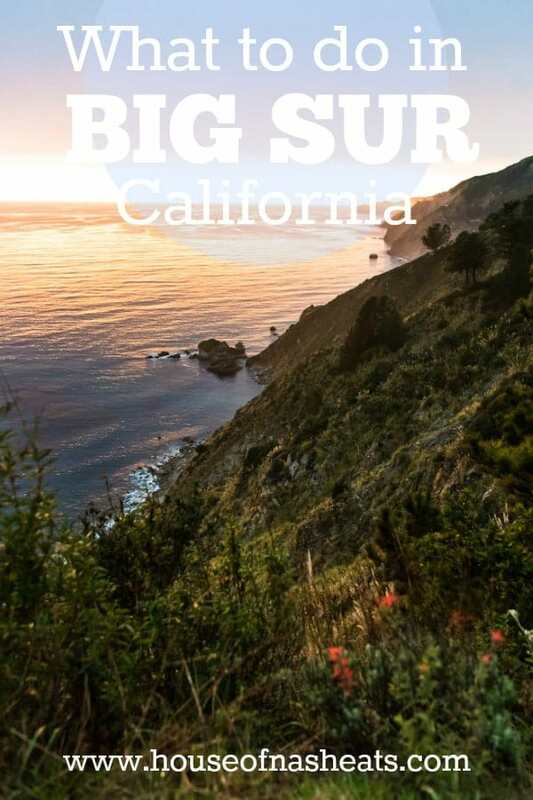 Really, Big Sur is a region covering 70 miles of the central California coast hugging the foothills of the rugged Santa Lucia Mountains and things are quite far apart. Wherever you stay, you’re going to be far from something. Also, if you get motion sickness, you will want to come prepared. Bring snacks: Sure there are places to stop and pick up something to eat, but the prices are borderline obscene. 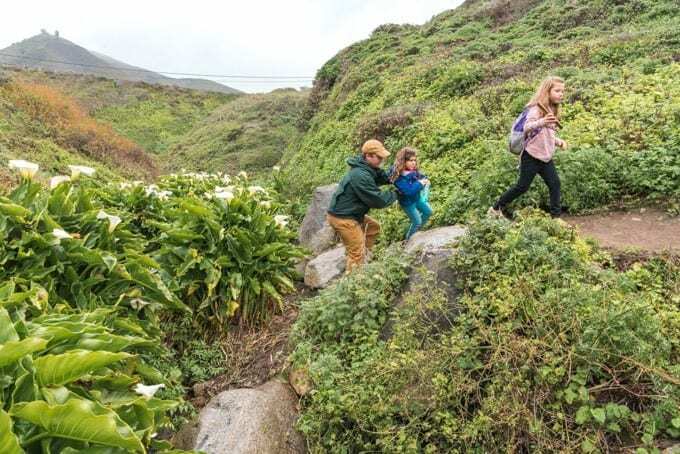 We grabbed some surprisingly delicious sandwiches at the grocery store in Carmel and took them with us on our hike to Garrapata State Park. 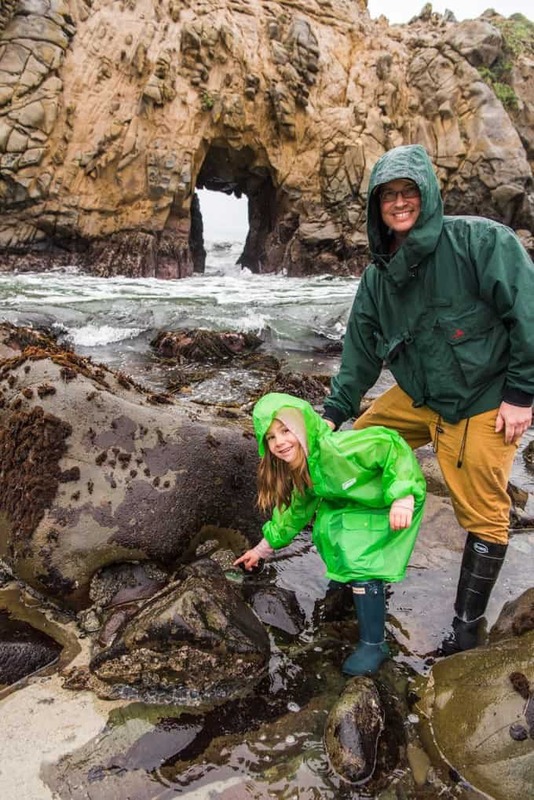 Prepare for the weather: No matter the time of year, the weather along California’s coast can be unpredictable, with mist shrouding much of the landscape and then sun shining brightly from seemingly one moment to the next. Even during the summer, the sunshine can be fickle and sporadic, as a blanket of fog often hugs the coastline, cooling things off dramatically. Be prepared for cool weather by bringing a warm jacket, no matter what time of year you go. Be flexible: Although it was overcast much of the day and pouring rain for a couple of hours in the afternoon, the skies cleared for this gorgeous sunset on our last full day in Big Sur. 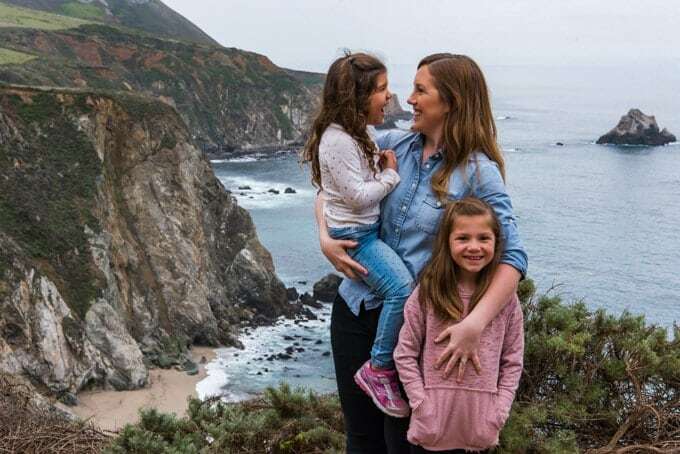 Give yourself ample time so you aren’t rushing through your time in Big Sur and you will see just how easy it is to be enchanted by this enchanting section of the California coast. 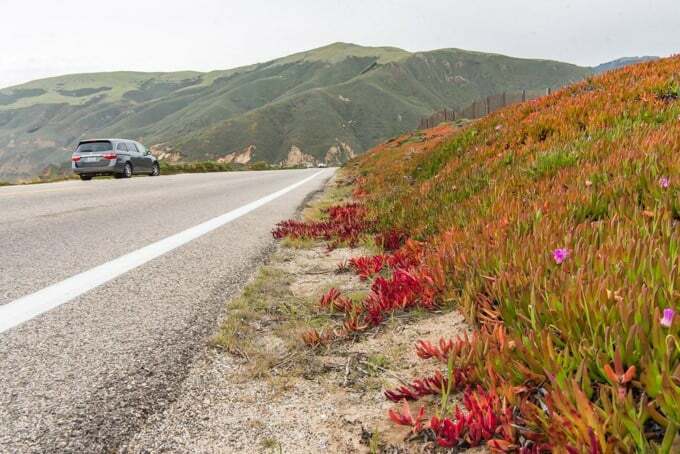 Have you driven the Pacific Coast Highway or been to Big Sur? 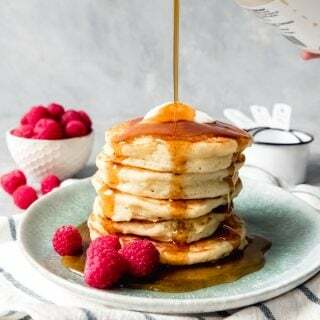 What other highlights do you love along the way? I’d love to hear from you in the comments! 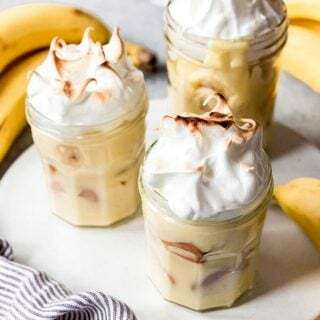 Or get in touch with me via Instagram or Facebook and be sure to follow my Family Friendly Travel board on Pinterest! Bummer that it was closed last summer! It’s still closed at the moment, although there is a 30 minute detour to reconnect to the southern route, but from what I understand the road work is scheduled to be completed by the end of this summer, opening up the whole stretch of road again! Every spot looks stunning but I am partial to the tidal waterfall. The bridge views are incredible too! I have not been to Big Sur yet now that I have seen it, I would love to go! 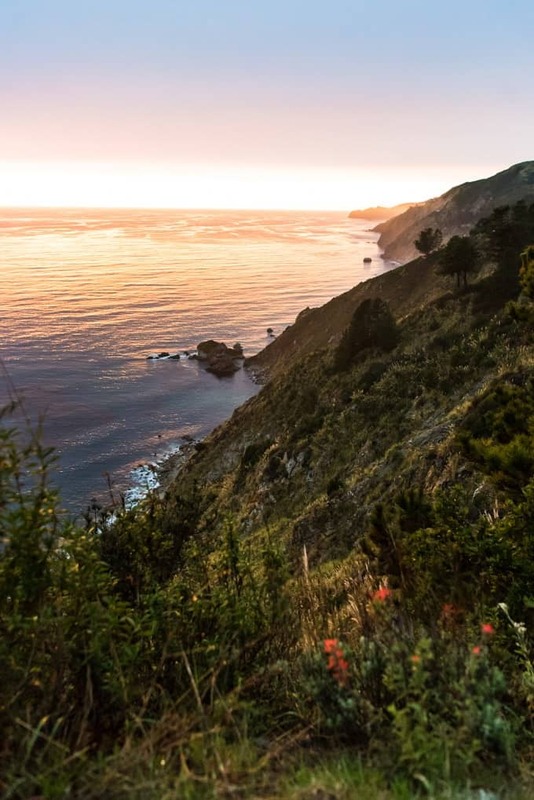 Big Sur is on our bucket list! I love the pictures of the coast and didn’t realize all of the other beautiful places to visit while there! 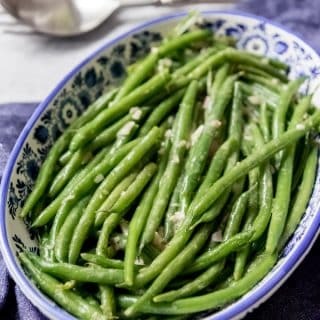 Great, informative article! I love this part of California! I drove a lot of Highway 1 between LA & San Francisco many years ago. I wish it were a time when social media was around so I had known about the waterfall – it’s gorgeous! thanks for the tips and absolutely stunning photos. 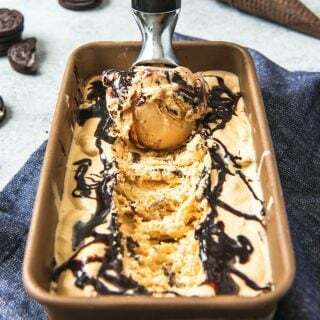 Adding this to our summer trips! It’s a fun one! 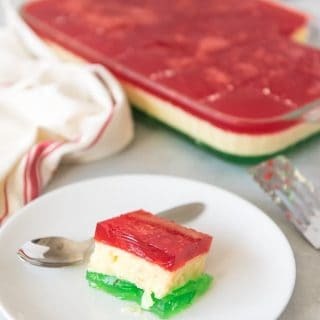 You guys will love it! Oh, I am so glad that I am close to the West Coast now. 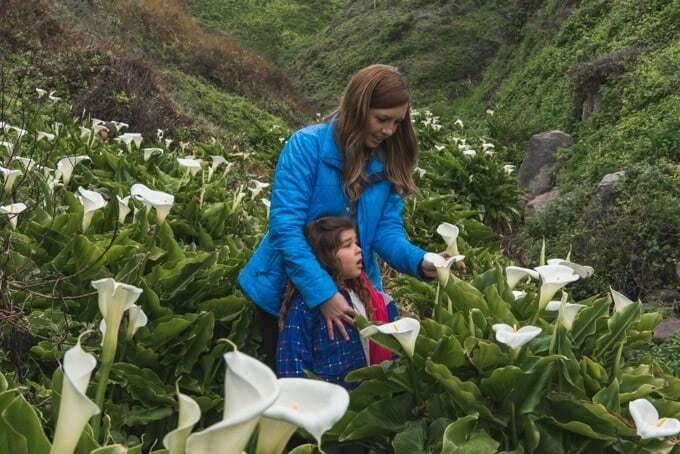 This looks like a great trip and all those lilies! 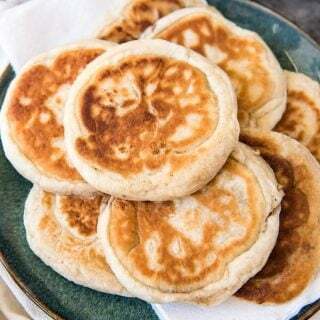 I could stare at those for days along with that coastline view. Glamping is certainly on my radar so that looks like a great spot to do that! Thanks for the travel ideas!